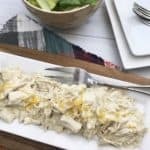 Creamy Cheesy Instant Pot Chicken - Keto Friendly!Creamy Cheesy Instant Pot Chicken - Keto Friendly! Creamy Cheesy Instant Pot Chicken – Keto Friendly! This Instant Pot chicken recipe is Keto approved! You can substitute chicken thighs to increase your fats as well. Place the chicken breast in the bottom of the instant pot and season with salt and pepper. Place the lid on the instant pot and press the manual setting. Set the timer to 10 minutes making sure the quick release valve is closed. Once the timer has gone off after cooking then do a quick release. You can add more shredded cheese (and bacon) if desired to your dish. This goes great with noodles, or if you are following a Keto lifestyle, serve on top of a bed of (prepared) Cauliflower Rice.